Create a SmartArt graphic to quickly and easily make a visual representation of your information. You can choose from among many different layouts, to effectively communicate your message or ideas. SmartArt graphics can be created in Excel, Outlook, PowerPoint, and Word, and they can be used throughout Office. For an overview of SmartArt graphics, including considerations for choosing the best graphic and layout type to display your data or convey a concept, see Choose a SmartArt graphic. On the Insert tab, in the Illustrations group, click SmartArt. In the Choose a SmartArt Graphic dialog box, click the type and layout that you want. 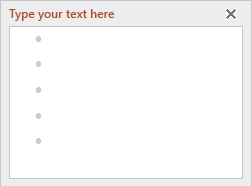 Click [Text] in the Text pane, and then type your text. Copy text from another location or program, click [Text] in the Text pane, and then paste your text. If the Text pane is not visible, click the arrow control on the left side of the SmartArt graphic. To add text, like a title, in an arbitrary position close to or on top of your SmartArt graphic, on the Insert tab, in the Text group, click Text Box to insert a text box. If you want only the text in your text box to appear, right-click your text box, click Format Shape or Format Text Box, and then set the text box to have no background color and no border. Click in a box in the SmartArt graphic, and then type your text. For best results, use this option after you add all of the boxes that you want. Click the SmartArt graphic that you want to add another shape to. Click the existing shape that is located closest to where you want to add the new shape. Under SmartArt Tools, on the Design tab, in the Create Graphic group, click the arrow next to Add Shape. If you don't see the SmartArt Tools or Design tabs, make sure that you've selected the SmartArt graphic. You may have to double-click the SmartArt graphic to open the Design tab. To insert a shape after the selected shape, click Add Shape After. To insert a shape before the selected shape, click Add Shape Before. To add a shape from the Text pane, click an existing shape, move your cursor before or after the text where you want to add the shape, and then press ENTER. To delete a shape from your SmartArt graphic, click the shape you want to delete, and then press DELETE. 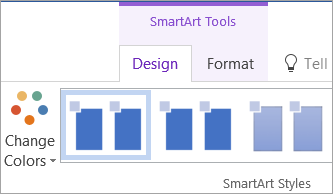 To delete your entire SmartArt graphic, click the border of your SmartArt graphic, and then press DELETE. To add a shape like a callout or a line, see Add shapes. You can apply color variations that are derived from the theme colors to the shapes in your SmartArt graphic. If you don't see the SmartArt Tools or Design tabs, make sure that you've selected a SmartArt graphic. You may have to double-click the SmartArt graphic to open the Design tab. A SmartArt Style is a combination of various effects, such as line style, bevel, or 3-D, that you can apply to the shapes in your SmartArt graphic to create a unique and professionally designed look. Under SmartArt Tools, on the Design tab, in the SmartArt Styles group, click the SmartArt Style that you want. To see more SmartArt Styles, click the More button . In the menu of types that appears, point at the type you want and then select a layout. On the SmartArt Design tab, in the Create Graphic group, click the arrow next to Add Shape. If you don't see the SmartArt Design tab, make sure that you've selected the SmartArt graphic. You may have to double-click the SmartArt graphic to open the SmartArt Design tab. To add a shape while using the Text pane, click an existing shape, move your cursor before or after the text where you want to add the shape, and then press ENTER. On the SmartArt Design tab, in the SmartArt Styles group, click Change Colors. On the SmartArt Design tab, in the SmartArt Styles group, click the SmartArt Style that you want. To see more SmartArt Styles, click the More button. On the Insert menu, select SmartArt Graphic. On the SmartArt tab of the ribbon, in the Insert SmartArt Graphic group, select at the type of graphic you want (List, Process, etc. ), and then select a layout. If the Text pane is not visible, click the editor control on the left side of the SmartArt graphic. Control-click the existing shape that is located closest to where you want to add the new shape. On the SmartArt tab, in the SmartArt Graphic Styles group, click Colors. On the SmartArt tab, in the SmartArt Graphic Styles group, click the SmartArt Style that you want. In PowerPoint Online, you can add and edit SmartArt graphics. On the Insert tab, select SmartArt. On the dropdown menu, select the layout that you want. The graphic is inserted on your slide. A text editor appears on the left of the graphic. Each bullet item in the editor corresponds to one item in the graphic. To enter text, click next to a bullet in the Text editor, and then type your text, or paste text that you've copied from elsewhere. You add shapes in the Text editor by pressing the Enter key to add another bullet item. You delete shapes in the Text editor by backspacing over the bullet item that you want to remove. You can apply color variations (which are derived from the presentation's theme colors) to the shapes in your SmartArt graphic. On the Ribbon, under SmartArt Tools, select Change Colors. On the menu that appears, select the color variation you want. A SmartArt Style is a combination of effects, such as line style, bevel, or 3-D, that you can apply to the shapes in your SmartArt graphic to create a professional look. On the Ribbon, under SmartArt Tools, select Styles. On the menu that appears, select the style you want. Point your mouse at any option to see a description name for the option. By default, the shapes in a graphic are ordered from left to right (or clockwise, if the graphic is circular). On the Ribbon, under SmartArt Tools, select Right to Left. The Text pane works like an outline or a bulleted list that maps information directly to your SmartArt graphic. Each SmartArt graphic defines its own mapping between the bullets in the Text editor and the set of shapes in the SmartArt graphic. To indent a line in the Text pane, select the line that you want to indent, and then under SmartArt Tools, on the Design tab, click Demote. To decrease the list level, select the line that you want to indent, and then click Promote (or press Shift+Tab). To resize your entire SmartArt graphic, click the border of your SmartArt graphic, and then drag the sizing handles in or out until your SmartArt graphic is the size that you want. In PowerPoint on Windows or macOS, if you already have text on a slide, you can convert slide text to a SmartArt graphic.